The causeway to Granite Island where you can meet the resident Little Penguins. 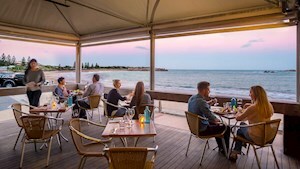 Nestled on a wide, sandy arc of Encounter Bay, Victor Harbor has been the summer holiday choice for generations of South Australians. Victor Harbor offers just about everything you could want for a relaxing holiday. With sun, surf and sand, clear turquoise waters and stunning views, outstanding early colonial architecture, and good pubs, cafés and restaurants, it's easy to understand why. There's even a Clydesdale horse-drawn tram journeying you 600 metres across the causeway to Granite Island where you can meet the resident Little Penguins. Spend time exploring Victor Harbor area and visit the stunning Hindmarsh Valley. Plenty to see and do in this spectacular part of the region including; Mount Billy Conservation Park, Hindmarsh Falls, Hindmarsh Valley Dairy, Victor Harbor Winery and the Seascape Retreat, a luxury nature based eco-accommodation. Along the coast, you'll find of some of South Australia's best surf beaches which can be easily accessed from here, such as Waitpinga, Parsons, Chiton Rocks and Dump Beach. Check with a South Australian Surf Life Saving Club or for safety tips visit Beach Safety. Between May and October, Southern Right Whales frequently visit Encounter Bay – learn more about these fascinating mammals, as well as other marine inhabitants at the SA Whale Centre. Of historical significance, Encounter Bay was named in 1802 by the famed navigator and mapmaker Matthew Flinders of the Investigator after his encounter there with French explorer Nicholas Baudin on board Le Geographe. Home to Australia's first public railway, you can now jump aboard the rattling Cockle Train for a family-friendly steam rail experience travelling on the old lines along the coast, through Port Elliot, Middleton and Goolwa. See what people are posting about Victor Harbor.